Q. What does our visit to your home involve? A. 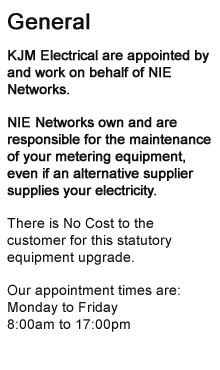 We will replace the metal/Bakelite box which is inside your meter box. This is situated at the end of your incoming supply before your meter. These older boxes are filled with bitumen and can occasionally weep. We are replacing these boxes with a modern box. Q. Am I charged for this? A. No, there is no charge to the customer for this upgrade. Q. Will my Electric be Turned Off or disrupted? A. 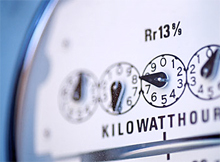 Yes, your power will be switched off at your meter board by the engineer while the work is carried out in your home. A. The whole process should take no more than three hours. Q. Why is this being done? A. The existing end box has been in place for some time, possibly since the house was built, and needs updating as part of ongoing maintenance. Q. How do I know the engineer calling at my home is genuine? A. Two of our staff, an engineer and mate, will call at your home. Both will have been issued with an NIE pass which they will present on arrival. Both will be wearing our company logo and their vehicle displays both the KJM logo and the NIE logo. Q. I cannot do without electric while this work is being done. A. We can provide a small generator to cover any essential equipment required. In order to facilitate this, however, we require prior notice. Please contact our engineer to discuss this. His number is on the calling card which you will have received in advance of our visit. Q. Will there be any mess? A. No, there will be no mess. Our engineers will clean up when they complete the work and will ask you to sign to confirm that you are satisfied. Q. Do we work at weekends? A. No, we work normal working hours, Monday to Friday, 8.00am to 5.00pm. Q. Do I have to do anything prior to the appointment? Is there any equipment I need to shut down before the power is disconnected? Our engineers will also ask you to make sure that you have shut down any equipment (for example � computers) that might be damaged if when we shut off your power. It would also be advisable that washing machines are not in mid cycle when the power is interrupted. Q. I have an alarm system. Is this a problem? A. No, this is not a problem providing your alarm system is regularly serviced and you are confident that there is a fully functioning battery back-up so that the cut in mains power does not affect your alarm system. If you are in any doubt, please check with your alarm provider before our engineers call to undertake the work on your meter box. Q. Why have I received a card through my letterbox and not a letter from NIE Networks? A. This card is to introduce us and to help answer any questions prior to our calling at your home. In order to reduce administration and environmental impact we try to keep paperwork at a minimum. Also, some houses have already had their end boxes replaced but we do not have details of these houses. Should an engineer discover that an area has already been covered he will move on to another area. We do not send letters as customers in these areas would then be left expecting an engineer to contact them. Q. The calling card refers in the first paragraph to the replacement of end box/meter. Will both be changed? A. No, the engineer will cross out one of these on your card as we use this card for both end box and meter changes. Q. Do I have to be at home when the work is being carried out? A. It is best that someone is at home; however, you can arrange to have a key left for our engineer to gain access. The engineers will not enter a property unless it is vacant (by agreement) or an adult is present. A. A complaint can be made by either completing the online customer feedback or by contacting KJM on 028 4483 0030. Q. I have made an appointment but need to cancel. What do I do? A. It would be appreciated if as much notice could be given as possible. You can contact the engineer directly using the telephone number given on the calling card you have received. Alternatively, you can contact KJM directly on 028 4483 0030.